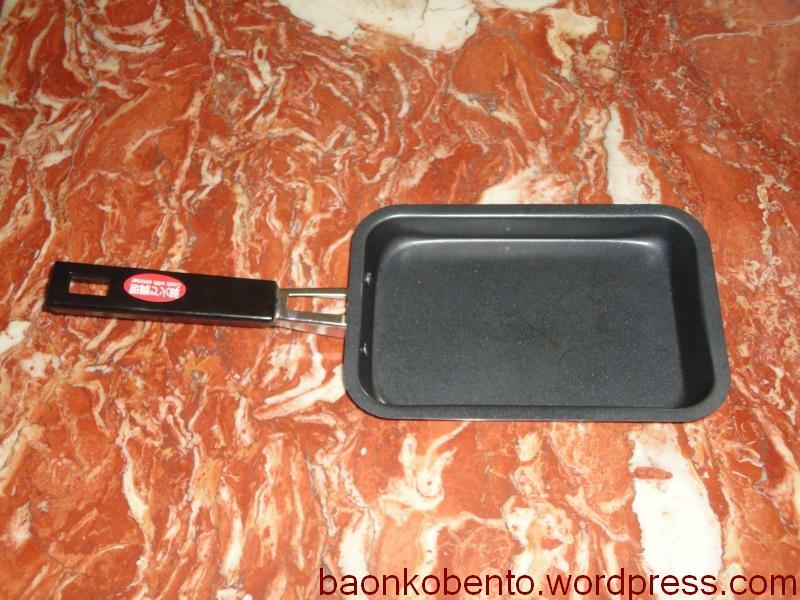 I got a new baby in the kitchen: a dedicated tamagoyaki pan, again bought from my favorite 100-yen store Saizen. I tried it out last week with the 4-egg tamagoyaki recipe. I was expecting to end up with a massive tamagoyaki roll, but after using about half the egg mixture the pan refused to accept any more and spewed out the roll. I think it has something to do with the height of the pan. Anyway I ended up with two really nice and neat tamagoyaki rolls which looks a LOT better than the rolls I used to make that went into my sushi. 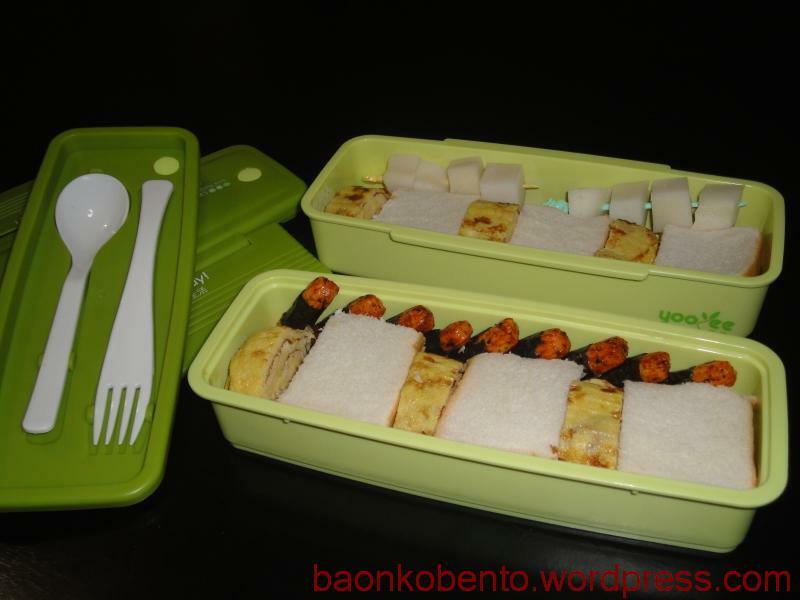 I used up one roll to make a sandwich-and-tamagoyaki bento, which also includes a couple of fish cake skewers and some norimaki rice crackers. 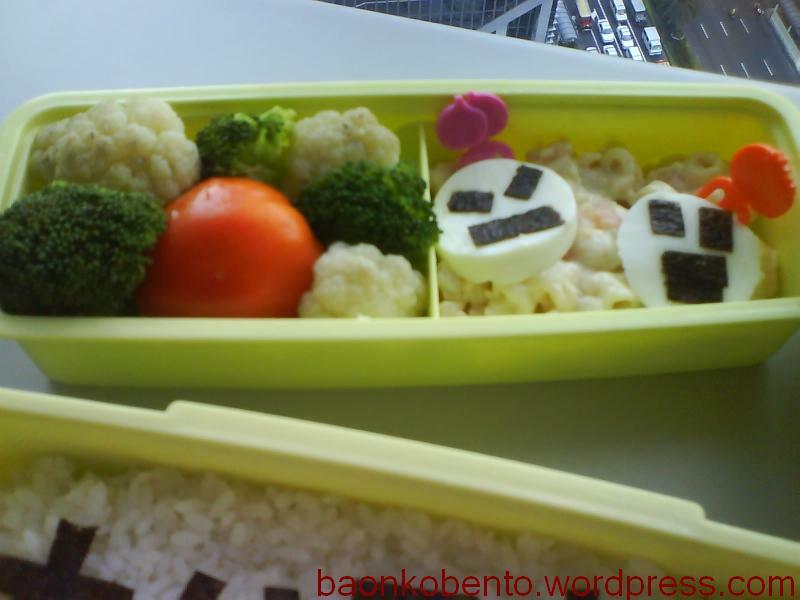 The shape and the height of the roll inspired me to make a kyaraben which was perfect for Bento Summer School Homework # 7. The body of the maiden is the entire uncut tamagoyaki roll, which I placed on top of a thin bed of rice mixed with commercial furikake. I used more white rice for the head, shaped using the top of an onigiri mold. I still have no nori face-cutters so I had to cut out the eyes and mouth by hand. The maiden’s arms and the hydra’s tentacles are all made from halved vienna sausage. The maiden’s hair is made from julienned squash which I steamed and sprinkled with salt. 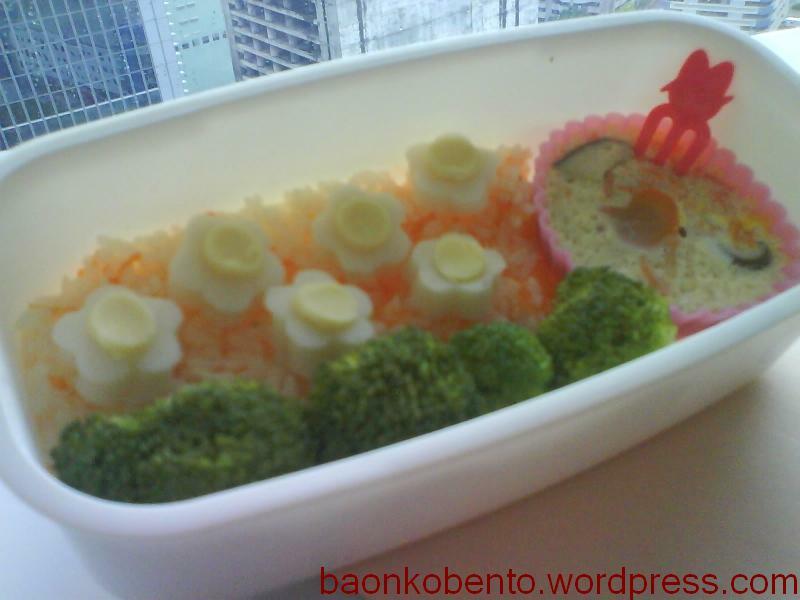 I shared this bento with two of my officemates last Saturday. In short notice, both the maiden and the hydra have been vanquished! 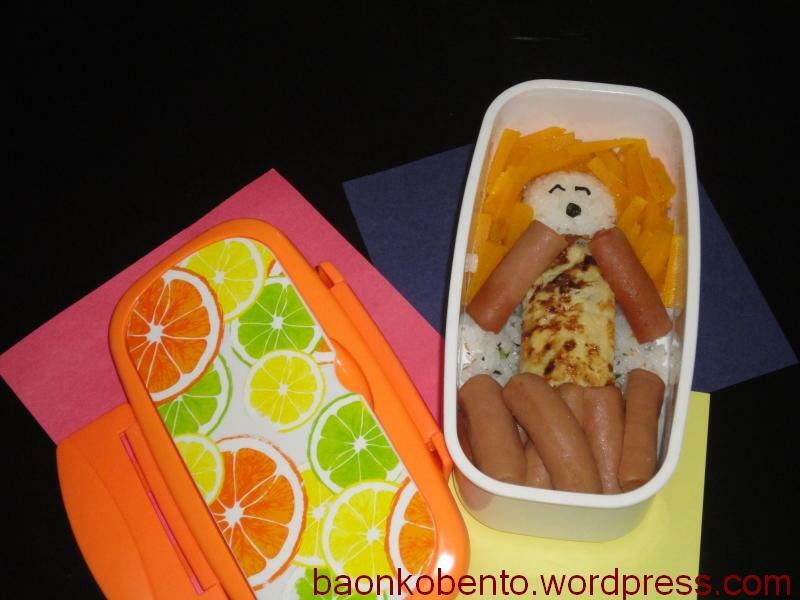 This is my entry for Bento Summer School Homework # 6. 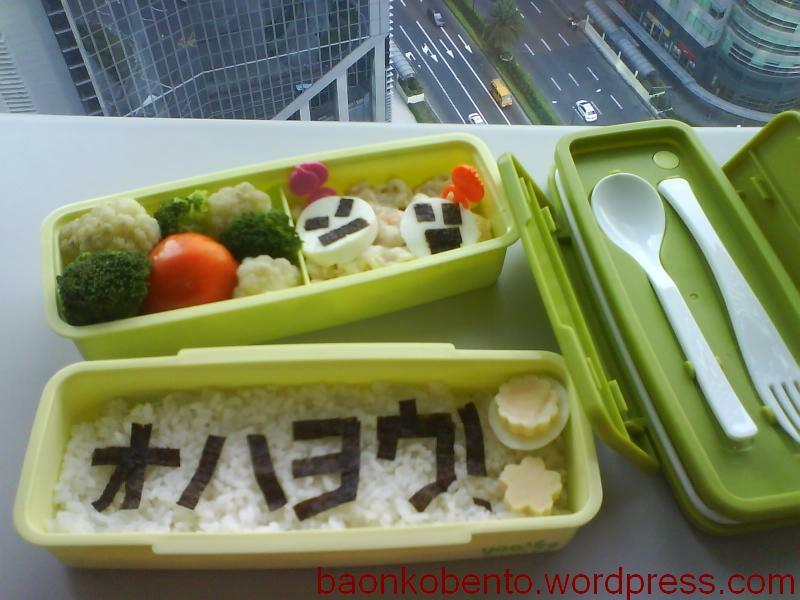 The task is to decorate your bento with cute shapes and faces. Unfortunately, I don’t have any face cutters (yet!). Instead, I concentrated on showcasing food cut into different shapes. The top tier has two round-top onigiri mixed with commercial furikake, circle-cut fish cake with nori bunnies, a vegetable fritatta butterfly sprinkled with 7-spice, and two mini-mushipan in cute silicone cups. The bottom tier had the rest of the rice with another type of furikake and some hotdog and fish cake skewers. That furikake is supposed to come out heart shaped, but I guess cookie cutters don’t really function as furikake stencil. I used long picks for the skewers. 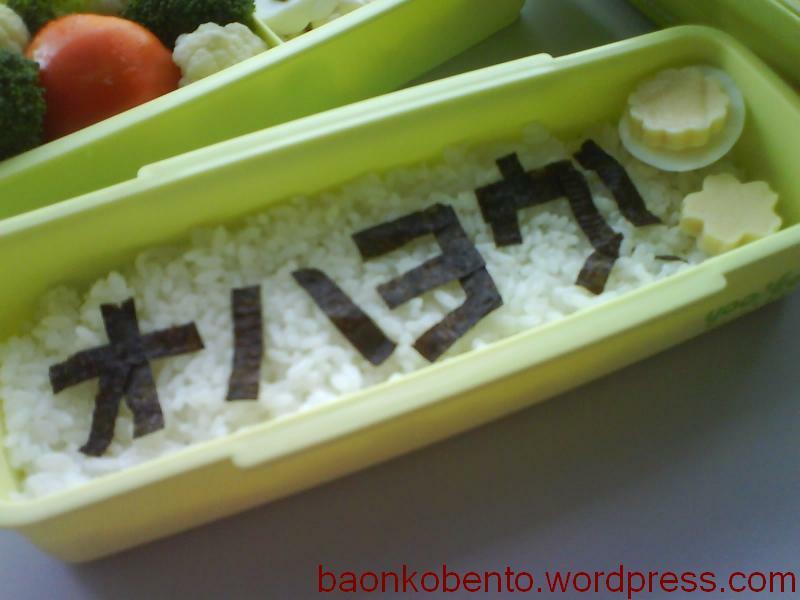 This is my entry to Bento Summer School Homework #5. It’s all about sandwiches! What a perfect excuse to brighten up T’s baon! 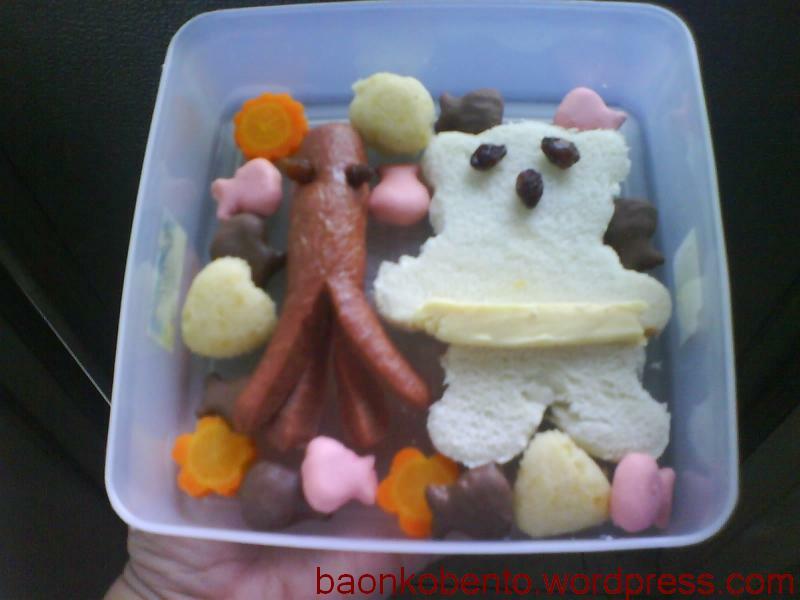 My octopus is made out of an entire chicken hotdog, while the bear is cut out of a cheese sandwich (with a cheese belt). Accessories include flower carrot cutlets, shaped mini-mushipan, and some chocolate and strawberry goldfish. The faces are made of raisins. You’ll see I’m just using a standard Lock n’ Lock box here (one of my first!). I wanted to avoid distracting the eye with funky box colors, so I kept it simple. 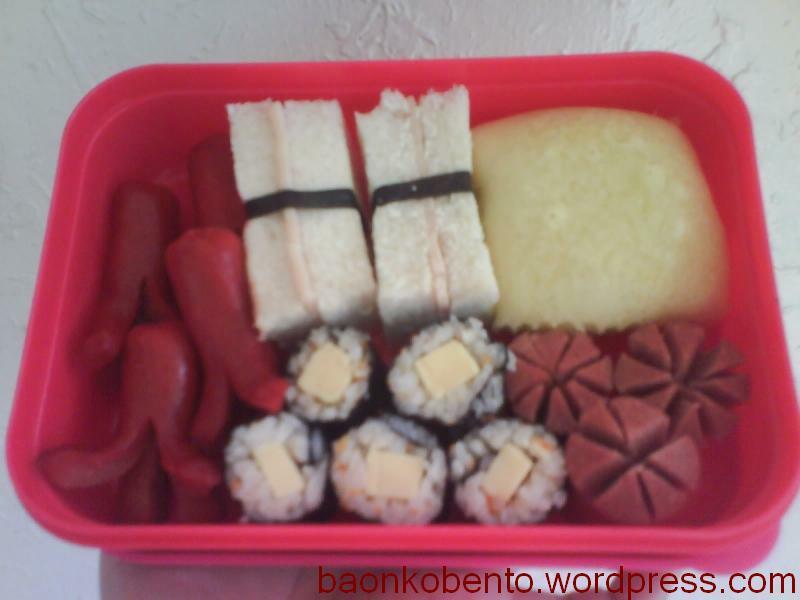 I really liked the taste of this bento that I went ahead and made a similar one for today. 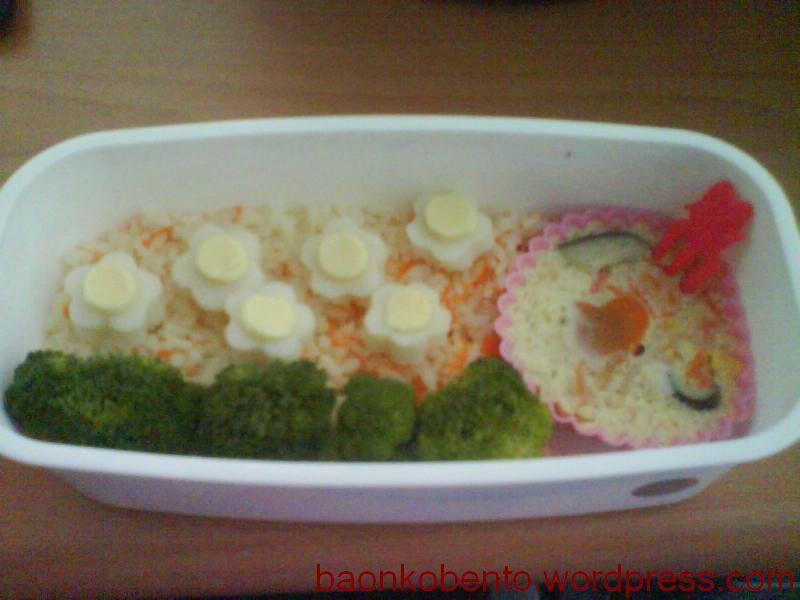 This is my entry for the Bento Summer School Homework # 2. 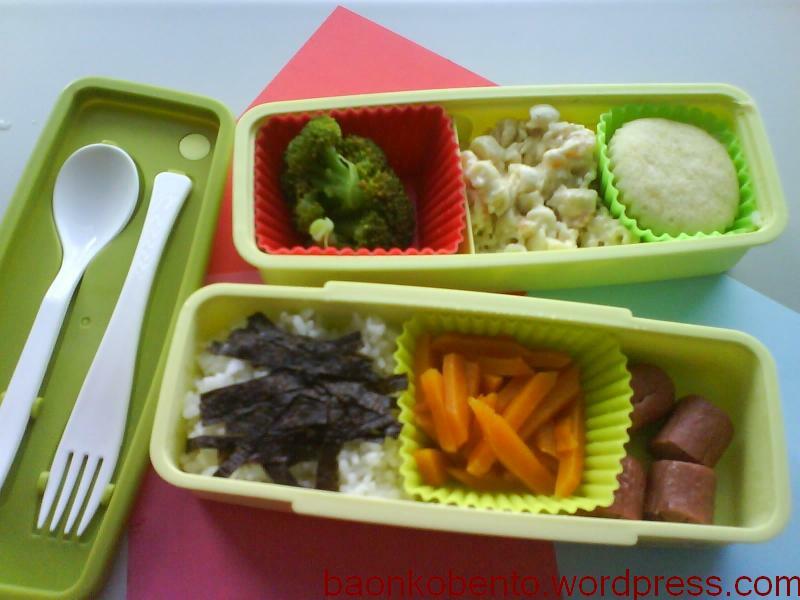 The task is basically to assemble a bento filled with finger foods, or food that does not require any utensils. This is my daughter’s school lunch yesterday. It’s basically made up of things that I just pulled out of the freezer and threw into the steamer, except for the makizushi, which I made on the spot. Clockwise from the left: there’s steamed cocktail hotdog octopii, ham sandwich with a nori strip to make it look like sushi, a mushipan, a jumbo chicken sausage cut into flowers, and a roll of cheese makizushi. I have been told that she ate most of it, which made me really happy! Yay! 2 exciting things in this entry: my second kyaraben, and my first recipe! 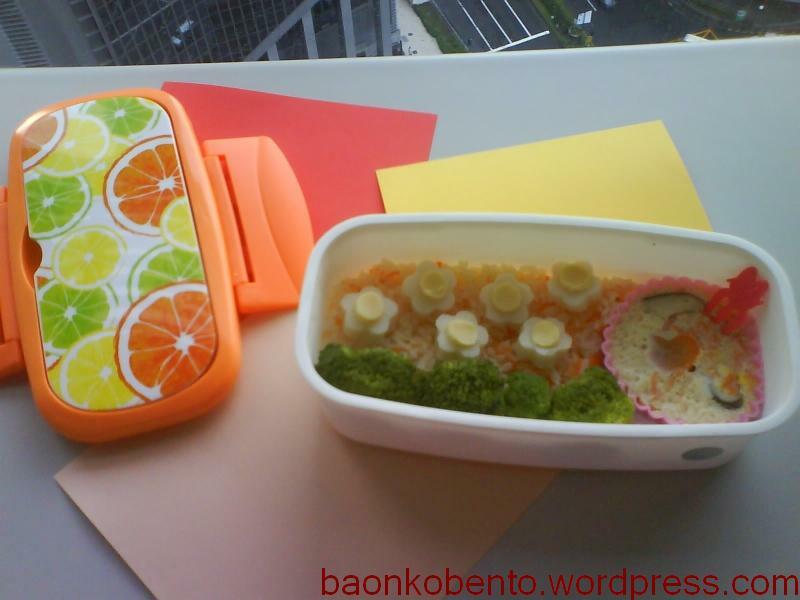 This is my entry for the Bento Summer School Homework # 1. The task is basically to adapt a non-muffin/cupcake recipe and use a muffin tin to cook it. 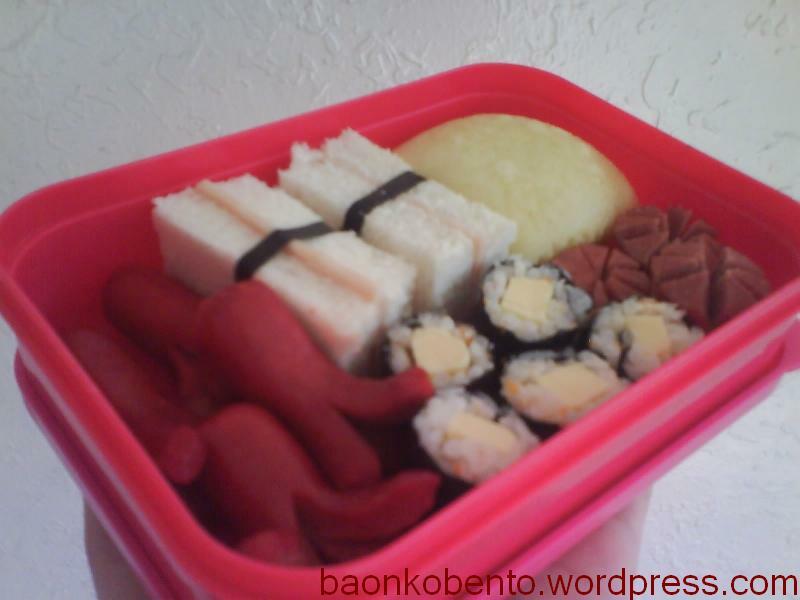 Then, for bonus points, to pack a bento using that recipe. 1 small carrot – Grate the carrot finely. 1 shiitake mushroom – Remove the stem. Slice into half inch strips. * Mirin, soy sauce, and sugar amounts can vary according to taste. Break the egg into a small bowl. While pouring the dashi stock into the bowl, gently stir the dashi with the egg. (Note: Do not beat! We don’t want bubbles into our mixture.) Add the mirin, soy sauce, and sugar and stir some more. Divide the grated carrot and sliced shiitake into three small silicone cups. Gently pour the egg mixture into the three cups. Some of the carrots and shiitake mushroom might float to the top; this is perfectly fine. Steam the eggs for around 12-15 minutes. Bento break-down: Here you’ll (barely) see that I put in a heart-shaped carrot slice in my chawanmushi, which is slightly submerged in the egg. I have a bed of carrot-rice beside the silicone cup (Carrot-rice: I put grated carrot, a bit of olive oil, and a dash of salt into the pot while cooking rice.) At the bottom is a row of steamed broccoli florets to represent grass. The flowers are actually flower cut outs off a steamed fish cake, with cheese circles in the middle. 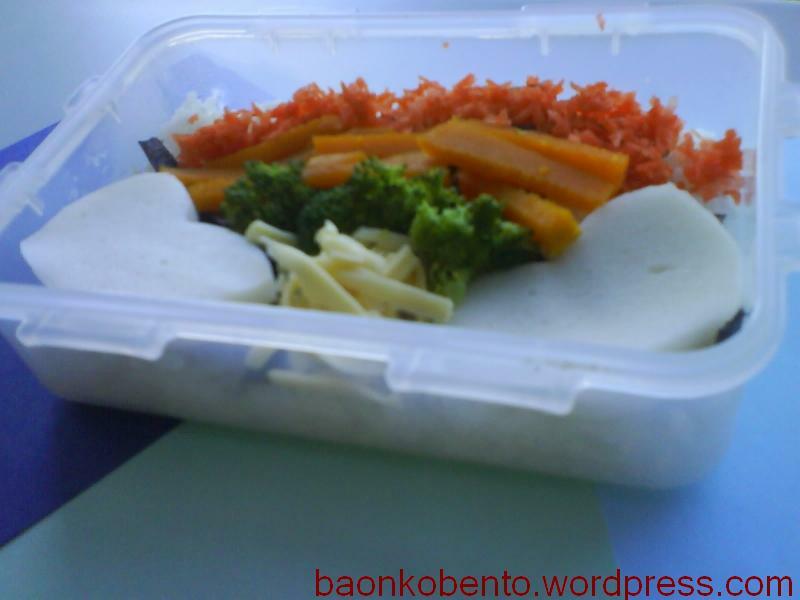 You’ll notice that this entire bento is made using only the rice cooker. 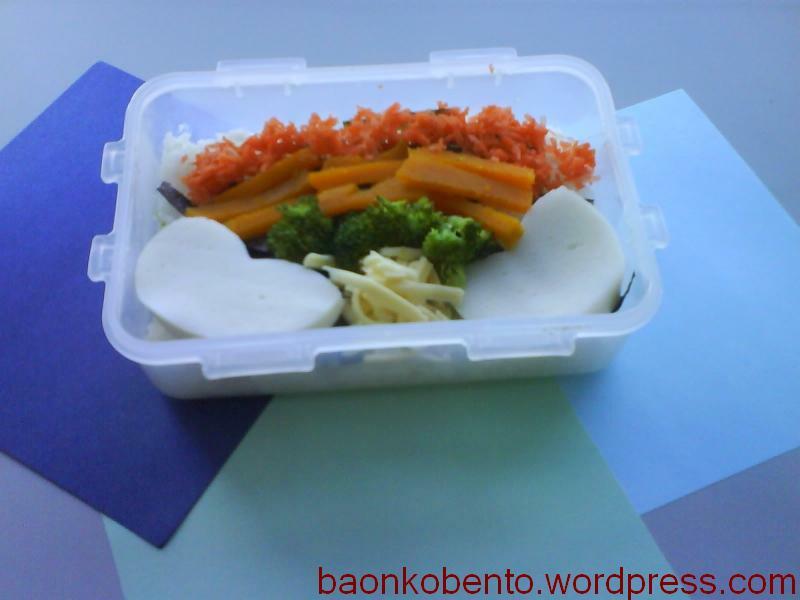 Prep time (including packing the bento) is around 35 minutes and the cooking itself is another 20 minutes. Composition: The bottom layer is basically just a rice layer with “オハヨウ!” written in cut-out strips of nori. Ohayou is “Good morning” in Japanese. Here, I wrote it in katakana instead of hiragana mainly because it’s easier to cut out katakana because it’s more angular. There is also a slice of hardboiled egg topped with cheese with scalloped edges (no, that’s not the egg yolk), as well as a slice of flower-shaped cheese. The top split-layer’s left compartment is a veggie section (steamed cauliflower and broccoli florets around a fresh tomato). The right side has a bed of mac, cheese, and shrimp topped with two slices of hardboiled egg (egg whites only) with nori faces. Thoughts: This bento is not quite the one I had planned a week ago. There is very little protein, because I had to ditch my original plan of using fried fish cakes. I bought these ready-made frozen fish cakes in Landmark and tried shallow-frying a couple. It actually turned out fine (and tasted like how I imagined it to taste like) but it spread smoke all over the house. I don’t think I want a repeat of that, so I’m sticking to sauteing at the most when it comes to frying. No more shallow- nor deep-frying, so I’ll need to find alternatives to cooking protein. I had planned to just boil the fish cakes as if putting in an oden, but I forgot to overnight-defrost the fish cakes. 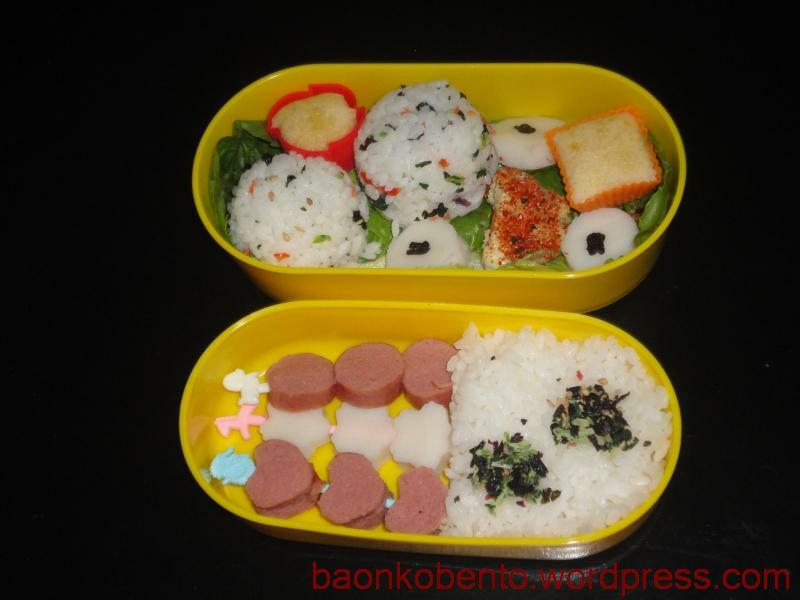 In addition, I find that the actual bento is smaller than what I had pictured. I was envisioning more room to put things. This is actually a good thing, helping me control the portion size and thus help me eat less. Nori is also very hard to shape. Notice that here, I made only the most basic of shaping, which is basically just cutting strips out of nori and arranging them to form things I want. On the positive side, steaming vegetables was a great idea! The colors are preserved beautifully, and they taste fresh too. I also got to use the picks I bought earlier, here arranged as if they were the hair on the two egg-faces. Lastly, the mac and cheese was awesome! Conclusion: I need to work on protein for bentos, as well as making better faces. I’m thinking of acquiring more food punchers and nori cutters. What do you think is a good theme for my next kyaraben?